Samsung Malaysia has just announced, via its Facebook page, a series of sneak previews of the upcoming Galaxy S4 for Malaysian consumers. 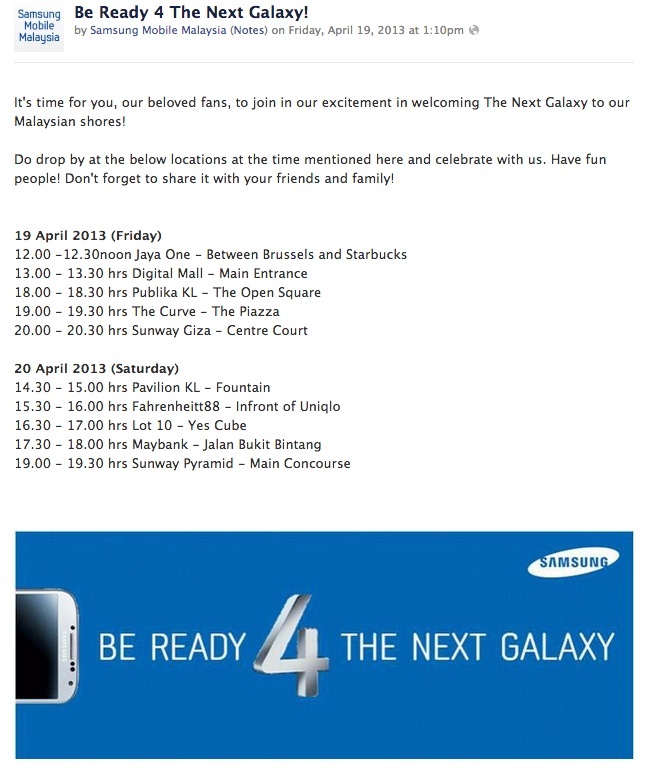 To be held over two days (today and tomorrow), these events will be held around some of the most prominent locations in and around the Klang Valley, and is the strongest indication yet that the Galaxy S4 will be coming very, very soon. Interestingly, these sneak previews will only be held over 30 minutes at each location. Those interested to “welcome The Next Galaxy” can head on to the venues listed above. However, any additional information regarding the device, such as pricing and availability, remain unannounced. Also, a curious image posted on the Facebook page of one the venues for the Galaxy S4 road show featuring a fake image of the Galaxy S4. 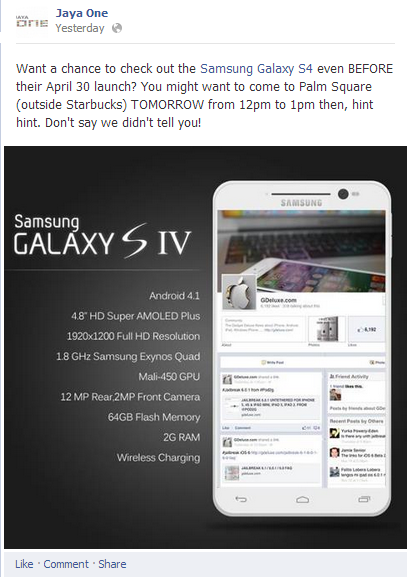 The post also states that the local launch of the flagship smartphone from Samsung will be held on the 30th of April. However, a reliable source have verified that the launch of the Galaxy S4 will not be held on that date. As it stands, the local launch of the Galaxy S4 remains unknown. Horror-Themed Lumia Live Centre Teaser Appears Online: What Nokia Malaysia Is Up To?